Andhra Pradesh Public Service Commission (APPSC) Chairman P. Udaya Bhaskar on Saturday said notification for Group exams would be released in two months. Mr. Udaya Bhaskar told the media that the syllabus for the Group exams would be finalised in a week. He said a final decision had already been taken on the changes incorporated in the syllabus under expert guidance. Changes were made to the syllabus of Group-1, Group-2 and Group-4 exams. Mr. Udaya Bhaskar said based on the vacant posts identified by the government, a roaster policy would be put in place after discussing it with the heads of various departments in the next two days. Candidates seeking jobs through APPSC must opt for OTPR (One Time Profile Registration), he added. Confederation of Indian Industry’s Southern Region Chairman and Elico Managing Director Datla Ramesh has exhorted students to acquire domain knowledge and expertise to meet industry expectations. To compete successfully with others, students need to develop unique skills and qualities, he said. By 2020, there would be a deficit of 3.5 crore workforce outside India and those with domain knowledge and proper orientation would be in a position to grab the opportunities, he added. However, Mr. Ramesh felt that focus on research and development was less in India and that was the reason many top industries were falling into the hands of others. However, pharmaceutical, automobile and bio-technology sectors were an exception as they had been running successfully with R & D-driven technology and reverse engineering processes. The CII Chairman also suggested that students should follow the latest developments in the IT and hardware sector like Industry 4.2, Cloud, Big Data and Automation in different fields. He advised the faculty to visit industries along with students for practical knowledge. Vice-Chancellor of the Nannaya University Prof. M. Mutyala Naidu called upon the students to uphold the dignity of the university by strictly adhering to the rules. Registrar K.S. Ramesh, Professors S. Teki, Matta Reddy, Y. Srinivasa Rao and Suresh Varma spoke and welcomed the freshers. Adikavi Nannaya University Vice-Chancellor Prof. M. Mutyala Naidu on Friday released anti-ragging poster in his chamber here. Nannaya University NSS Unit-IV along with the Botany Department have designed anti-ragging poster and it was sponsored by Future Kids’ School, Rajamahendravaram. The posters were put up on the university campus as well as hostels. Speaking on the occasion, Prof. Mutyala Naidu said students should not indulge in ragging and instead focus on course completion. NSS Coordinator Prof. Suresh Varma said that students should inform the police in case of any ragging activity. B.Ed. College Principal Prof. K. Subba Rao, Science College Principal Prof. Matta Reddy and Academic Dean Prof. Teki, Future Kids’ School correspondent Ravibabu, school academic coordinator Padmavati and others were present. HYDERABAD: It's raining private universities in the upcoming capital city of Amaravati. The expert committee on private universities will meet in the first week of September to clear about half a dozen proposals. Once the panel clears the proposals, the government will issue the letters of intent. Most of the institutions of higher learning will come up in Amaravati. A group of ministers (GoM) will later clear the allotment of land to these private universities. The panel had met thrice since the promulgation of the Andhra Pradesh Private Universities Act, 2016. The fourth meeting is scheduled for the first week of September. 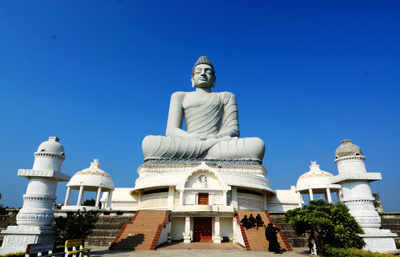 The private universities that have expressed interest to set up their campuses in Amaravati include Saveetha Medical University, Amrita University, Vedic University, Karunya University, International School of Computer Science in coordination with JNTU, Kakinada, The Energy and Resources Institute (TERI), and the Institute of Financial Management and Research (IFMR). Some of the proposals have already been scrutinized. The proposed Vedic University is the first of its kind institution in the state. The panel created a record of sorts by clearing proposals fast. According to officials, the total investment by private universities will be about Rs 10,000 crore over a period of 10 years. "The private universities Act focuses on capacity addition and quality of education. The Act binds the government to track the proposals and dispose them within the time schedule," said Anand Sudarshan, a member of the expert panel. At least half of dozen proposals will be cleared at the meeting. Earlier, the government issued the letters of intent to four private universities -- Vellore Institute of Technology, SRM, Amity and Centurion. The government had allotted land to Vellore Institute of Tchnology, SRM and Amity in Amaravati. They will invest about Rs 4500 crore in next 10 years. Centurion University will begin classes this academic year from a temporary campus. The AP government has also entered into agreement with a few foreign educational institution. NUS Singapore will offer Phd fellowship in areas of leadership and mind-set change, public policy, data analysis, and smart cities. Harvard Business School and Stanford University will offer research programmes in collaboration with Andhra University. Education Cities would come in Visakhapatnam and Amaravati, where premier institutions would set up their campuses, HRD Minister Ganta Srinivasa Rao said here on Monday. “Since the passing of the Private Universities Bill, many top notch institutions have been seeking allotment of land in the capital region. The Chief Minister has already allotted land to several universities and institutions,” the Minister said after entering into his new office at the Government Interim Complex. Relocation of the HRD personnel to the new office would be over by Dasara, the Minister said. Stating that the government was committed to revamping the education sector, he said that budgetary support to it had been doubled to Rs.21,000 crore, and an additional Rs.5,000 crore would be spent on infrastructure. “The budget for the sector has been enhanced to 17.5 per cent by the present government when compared to 10 per cent by the previous government. We are also trying to include lessons on moral values and ethics in the school curriculum. We are making the staff accountable by introducing the biometric attendance system, and will soon link it to scholarship,” the Minister said. When asked about the status of allotment of land to SRM University in view of the arrest of its chairman T.R Pachamuthu, the Minister said that a decision would be taken by the Chief Minister after ascertaining whether the charges against the latter had been politically motivated or not. Senior officials, including Chairman of the A.P. State Council for Higher Education L. Venugopala Reddy, Commissioner for Collegiate Education B. Udayalakshmi, and DEO Srinivasula Reddy were present. Later, Minister for Women and Child Welfare P. Sujatha performed a simple house warming ceremony to enter her new office. Hyderabad: The expert committee on scrutinising the proposals of private universities to set up their campuses inAndhra Pradesh on Monday examined 10 fresh proposals including offers made by World Peace University, Vel Tech andKarunya University. The committee has also been mandated to oversee establishment of an education hub in the state as well as put in place the accreditation process for the new private universities. Among the other institutions that evinced interest in setting up campuses in AP, specifically in the Amaravati region, are Saveetha University, Amritha University,Mahatma Gandhi University, YVR, Seer Academy, Great Lakes International Institute and Vedic University. After the committee finally verifies all the proposals and gives the nod, the same will be placed before the group of ministers for final clearance. The TDP government has already issued letters of intent to four universities, Amity University, SRM University, Vellore Institute of Technology and Centurion University. The process of awarding letter of intent to Institute for Financial Management and Research (IFMR) is on, said sources. It is expected that these institutes will bring in about Rs 5,000 crore investment into the state over the next five years. The committee will also oversee the establishment of an education hub in the state. Monday's meeting also decided that the process of accreditation for these private universities will be put in place by January, 2017. Also, a meeting of investors to further attract top foreign and domestic universities is to be held soon. To achieve all the targets, a project monitoring unit (PMU) is to be set up with the higher education principal secretary as its chairperson. The PMU will ensure that potential investors are given proper guidance as well as take up preliminary analysis of fresh applications by institutions and coordinate with the expert committee. Krishna University Vice-Chancellor S. Rama Krishna Rao on Saturday appealed to the teaching staff to earn better grade in the inspection to be done by the National Accreditation and Assessment Cell. The Krishna University has all set to go for NAAC inspection during the academic year 2016-17. Addressing the teaching staff, non-teaching staff and research scholars at an awareness programme on NAAC assessment, Professor Krishna Rao said that each department was required to contribute its due share in earning the better grade. The Internal Quality Assurance Cell of the university has been given the task of preparing for the NAAC inspection. Krishna University founder Vice-Chancellor M. K. Durga Prasad explained the university authorities on preparations and procedures of the NAAC inspection. Internal Quality Assurance Cell co-oridinator P.V. Brahmachari and other teaching staff were present. A clutch of reputed educational institutions from around the world are scheduled to hold consultations with officials of the AP-Capital Region Development Authority (AP-CRDA) at its office here on the establishment of their branches in Amaravati on Tuesday. CRDA Commissioner Ch. Sridhar will explain the Andhra Pradesh Government’s vision to transform Amaravati into a world-class educational hub and discuss the roadmap with those keen on setting up their institutions in the emerging capital city. The objective of the consultations is to partner with the best of international schools for providing a wholesome learning environment and experience for children in the city. Municipal Administration Minister P. Narayana, Principal Secretary (Energy, Infrastructure & Investments, and CRDA) Ajay Jain and the CRDA Commissioner have been instructed by Chief Minister N. Chandrababu Naidu to get in touch with the best schools in the world and highlight the opportunities available to partner with the A.P Government. According to an official release, the government has earmarked more than 2,100 acres in the capital city for educational institutions and it hoped to facilitate knowledge exchange programs with schools from Japan, Singapore, United Kingdom etc., in addition to providing the kind of environment in which they would set up their institutions. Schools which have a global presence, like in Singapore, Dubai, and Abu Dhabi, are expected to meet the CRDA officials on Tuesday before sharing their views and experiences with the Chief Minister. Representatives of 13 leading international schools from across the globe expressed interest in setting up their campuses in the new capital city. The AP Capital Region Development Authority on Tuesday held a roundtable with the representatives on requirement of at least two international schools, five private schools and a residential campus in Amaravati by 2019. Laying out the context, Ajay Jain, Principal Secretary, Infrastructure, explained in detail to the audience the vision for overall economic development and employment generation in the city. He detailed the recent developments in the capital city regarding infrastructure, funding, and the anchor sectors chosen for the capital city. Elaborate details regarding the estimated numbers in the capital city pertaining to the jobs, population and GDP expected were also shared. Later, Mr. Ajay Jain proposed to release an RFQ (Request for Qualification) by the end of October promising all support of the government to ensure that allotment of required land and approvals is finalised latest by February 2017.